Recipe for making a pitaya, or dragon fruit, bowl at home. A tasty way to cool off with this superfood. After a few weeks of vacation splurging on daily ice cream and skipping yoga, I wasn’t feeling quite as great as my old self. So I’m back to my normal eating and feeling great with lots of energy again. My girls love to visit Backyard Bowls here in Santa Barbara for an acai bowl or pitaya bowl (or smoothie) topped with granola. Pitaya is another name for Dragon Fruit. They think the bowls are a lot like frozen yogurt because they are so smooth, cold, and sweet. But they are actually packed with amazing antioxidant ingredients and are 100% natural. The next time you get a craving for ice cream, try one of these icy bowls instead. You’ll feel much better. The only problem with buying the bowls is that they are not cheap. Making them at home is a great solution. Add a little liquid and use your food processor to make a thick – ice cream like bowl, or add more liquid for a smoothie. My girls and I all love cold, thick, and creamy smoothie bowls. The girls especially get a kick out of using the dragon fruit packs because the bright fuchsia color is so vibrant. I think we may say “wow” every time we blend a pack! 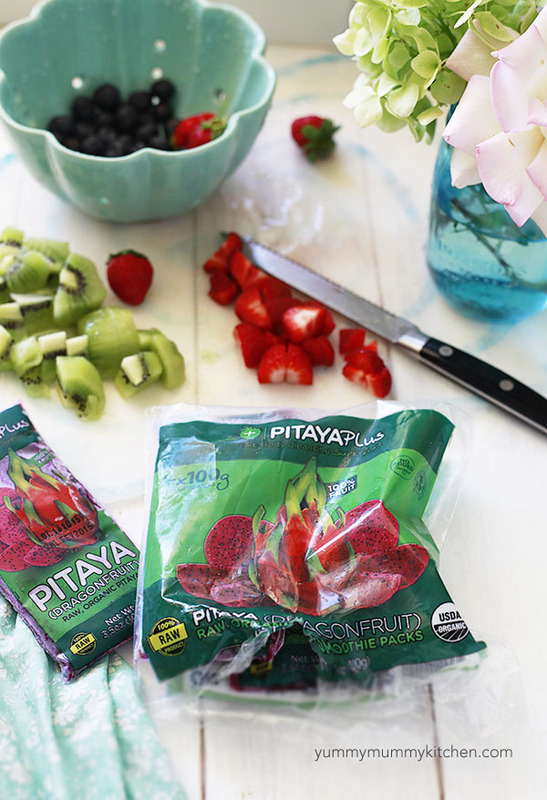 These frozen Pitaya Plus packs are available at natural foods grocery stores. I have seen dragon fruit/pitaya smoothie packs at Sprouts and Whole Foods. You can enter your location to find the nearest location they are sold here. They are such a convenient and tasty way to enjoy this super fruit. And they are organic, raw, and non-GMO. If you want to boost the protein, feel free to add a scoop of your favorite protein powder. I like to top my smoothie bowls with something crunchy. Nuts, seeds, granola are all great options. Some fresh fruit such as sliced bananas or fresh berries are fun additions as well. 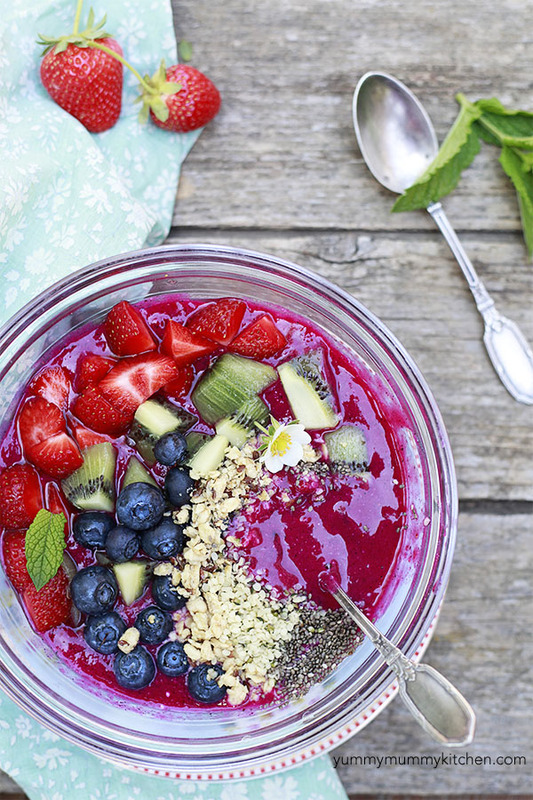 Turn your smoothie bowl into a work of art, or keep it simple. It’s up to you! I hope you enjoy this simple recipe and make your own dragon fruit bowl soon. 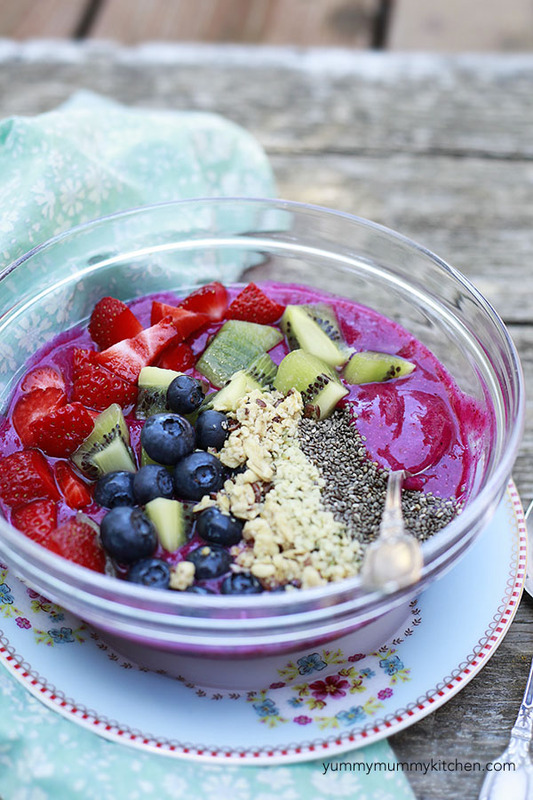 An easy, refreshing, and beautiful pitaya, or dragon fruit, smoothie bowl made at home. Roughly break up the frozen pitaya into chunks if using the pack and place it into the bowl of a food processor or good blender. Add any other frozen fruit and just enough liquid to blend. Blend until well combined. Transfer frozen mixture to a bowl and top with your favorite toppings. Enjoy right away or freeze until you're ready (but not too long or it will be rock hard). Nutrition information for this recipe will vary depending on toppings. Instead of freezing until ready to eat, you could just refrigerate it on a cold enough setting that won’t freeze and harden it, like they do at jamba juice. The texture and consistency of the mixture doesn’t seem to be affected. They pre-make a lot of their bowl base mixtures and refrigerate them until a customer requests it. Then all you gotta do is add toppings later. Just a suggestion. Hope it helps. Also I don’t have this on caps lock I have no idea why this comment is typing in all caps.